Philly Sport and Social, which holds co-ed recreational sports leagues across the Philadelphia region and tri-state area, has returned to the Main Line for the first time since they arrived in 1993. Calling all Main Line guys and gals who are looking to keep in shape and make new friends this fall! Philly Sport and Social, which holds coed recreational sports leagues across the Philadelphia region and tri-state area, has returned to the Main Line for the first time since they arrived in 1993. The league boasts over 25,000 members year round who take part in their various sports. 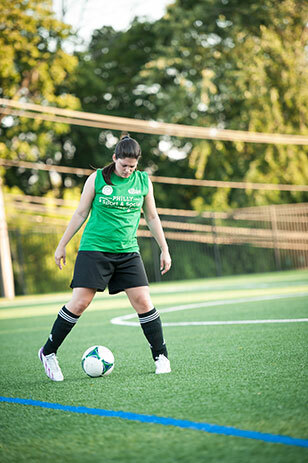 This fall they are offering coed kickball and coed soccer leagues in Radnor. Starting Sunday evening September 14th, at the Radnor Memorial Park on Matson-Ford Road (adjacent to Archbishop Carroll High School), games will be played under the lights on the turf field. PSSC is taking registrations for teams and ‘free agents’ now! We sat down with Tim Horan, PSSC co-owner and a former player, to learn more! AroundMainLine.com: What is Philly Sport and Social? “Dozens of families have been created through our leagues over the years. My wife Kelly and I met at a party in Avalon-thrown by a friend who I met playing in our touch football league in Fairmount Park,” enthused PSSC co-owner Tim Horan. AML: Since this is a social club with young guys and gals, I’m sure you’ve seen your share of ‘PSSC weddings’ through the years! PSSC: Dozens of families have been created through our leagues. My wife Kelly and I met at a party in Avalon-thrown by a friend who I met playing in our touch football league in Fairmount Park! AML: Talk about the upcoming Main Line fall leagues. 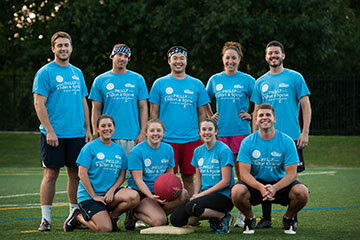 PSSC: We just completed our summer coed kickball and coed 6 vs. 6 soccer leagues and we’re now registering teams for our Fall Sunday Kickball and Soccer Leagues. Games will be played on the artificial turf field at Radnor Memorial Park on Sunday nights. Opening night is September 14th! AML: How do people register for leagues? PSSC: Registration is open to both teams and individual “Free Agents.” We place Free Agents on existing teams or create new teams comprised of all Free Agents. AML: Do you have to be in great shape to play in the leagues? PSSC: Being in shape helps, but certainly is NOT a requirement. We have players of various fitness and skill levels. One “requirement” is to step on the field with “having fun” in mind! AML: Philly Sport and Social is more than just sport…you plan great events for the members. Philly Sport and Social is more than just sport. Each league is associated with a sponsor bar where players meet after games. PSSC: Each league is associated with a Sponsor Bar where players meet after games. We also organize trips to Phillies games, theme parties, and other fun events. Keep an eye out for our 3rd Annual Conshohocken Costume Crawl! AML: What can new members expect? PSSC: Once all teams and players have been registered, our staff create schedules and start the leagues. All teams qualify for the playoffs, which are held immediately following the completion of the regular season. All players receive colored team shirts to wear during games. AML: What’s the best part of being a PSSC player? PSSC: Spending time with friends new and old while playing a sport you love. Rehashing games over a few beers at a local sponsor bar is pretty fun too!